Nashim has supported and promoted Jewish women's feminist art since it's inception in 1998. Many of the Women of the Book artists have been featured in the journal whose interdisciplinary, academic forum includes articles on literature, text studies, anthropology, theology, contemporary thought and the arts. We are taking this opportunity to spotlight the critical, creative and feminist thinking represented by both Nashim and Women of the Book. Curators: Nashim Art Editor, Judith Margolis and Nashim editors, Renée Levine Melammed and Deborah Greniman will dialogue in an open and dynamic forum with participating artists. Guest of honor: Israel Prize recipient, Alice Shalvi. *Nashim Journal is sponsored by the Shechter Institute of Jewish Studies and the Hadassah Brandeis Institute. In an hour-long visual presentation, Gilah Yelin Hirsch will present her much published theory on the origin of alphabet, (most recently in MIT Leonardo Journal, April 2014 - Artist as Scientist in a Reflective Universe). During lengthy, solitary sojourns in wilderness, the artist identified 5 patterns in nature that reflect the neurons and neural processes of perception and cognition. Later used in all alphabets, she discovered that these forms were first used in the earliest iteration of the Hebrew alphabet. Hirsch suggests that the mysticism of Kabbala is actually a formidable scientific use of these forms to elevate consciousness. Gilah Yelin Hirsch is an internationally known and award winning, multidisciplinary artist blending art and science in many media. She holds the position of Professor of Art at California State University Dominguez Hills, Los Angeles, California. 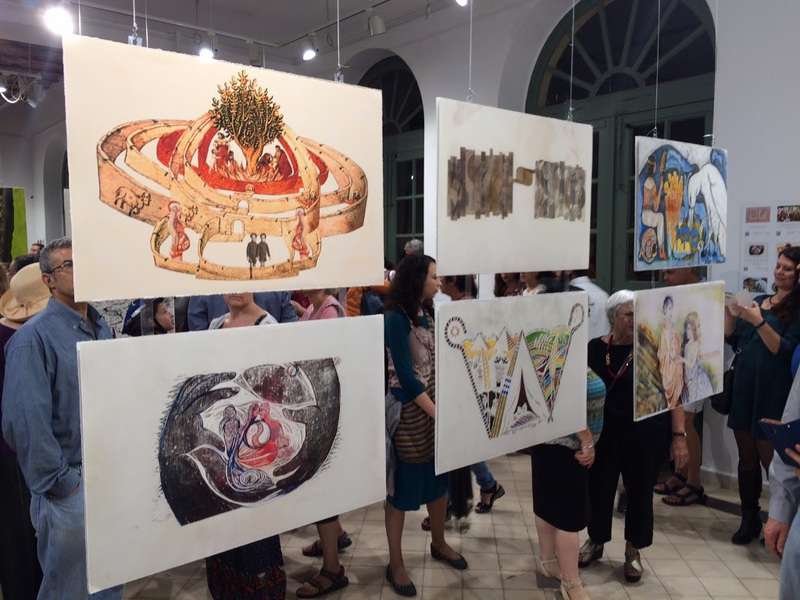 Women of the Book Founding Artist and Torah Scribe, Shoshana Gugenheim, invites her teacher, Master scribe, Dov Laimon, to an open dialogue on the Student-Teacher relationship in the context of teaching women to scribe and women becoming Torah scribes. Join us for an intimate conversation on this historic and controversial trend in Jewish learning. Join Chaya Lester - acclaimed spoken word artist - for an evening of electric and inspirational Parsha Poetry. Chaya will be performing the best of her spoken-word poetic commentaries on the Torah. The performance will be followed by a workshop in harnessing your own voice and highest expression. More about Parsha Poetry: Writing poetry on the parsha allows uncommon access to a truly “living Torah”. It is the alchemy that happens at the intersection between life and text – where your life becomes a commentary on the text and the text becomes a commentary on your life. Join us for a L'Chaim of expression. Bring the Torah to life...to your life. Writing Workshop on "Writual: How to Access Your Highest Voice"
with which we 'divine' - or 'find' - ourselves as well as become our 'divinest' selves. We will be guided by rich Kabbalistic teachings on writing and word. This spiritual technology will illuminate issues such as Spontaneity, Craft, Presence, Imagination and the Sanctity of Creativity. All levels of Jewish or literary background welcome. About Chaya: Chaya Lester is a Jerusalem-based Jewish educator, psychotherapist and performance artist. In addition to her doctoral work in Jewish Studies at Oxford University, she holds an Ivy League BA in English & Jewish Studies, and an MA in Clinical Psychology. Chaya has taught and inspired thousands through her unique classes and creative expression. Her approach is an innovative synthesis of psychology, spirituality and the arts. She currently serves as the Co-Director of the Shalev Center for Jewish Personal Growth. Judaism and other traditions “of the Book” (Christianity and Islam ) have diminished and repressed the energy and social place of the Spiritual Feminine that existed among the Pagan and Goddess religions before them. Through working creatively with the characters of Leah and Lilith, Jewish manifestations of the archetypal Feminine, the current split of the Spiritual Feminine in our contemporary society and modern psyches is brought to light and addressed. A Question to be discussed: Do women artists have a “different or unique” perspective? Followed by a talk about the process of making art by working directly with the unconscious and its personal and collective manifestations in the way of dreams, synchronicities and myths. A Question to be discussed: Is there a Spirit path to art in modern times? This session will take place in English. We breathe and sound rides on the breath; this is our song. But how do we bring our fullness to this song? How do we open our mouths and let the sound pour out? This a lab, an exploration of what our relationship to our voices is and what it can be. With Tehilim and Torah as our touchstone texts, we move from breath and sighing, to sound and song. Workshop Format: The workshop is 1.5 to two hours long. Participants sit on chairs in a large circle with room to stand up and push the chairs back. The venue is one in which sound can be contained and in which the participants' experience will be private. Based in Canada, Aviva Chernick has garnered critical acclaim and a devoted following as the charismatic lead singer of the twice JUNO-nominated group Jaffa Road. Now, with her eponymous solo project she has revealed stunning range in her musical persona. Inspired by her work as a cantorial singer and Shlichat Tzibur, and by her study of the Balkan Judeo-Spanish tradition under the tutelage of the legendary Flory Jagoda, Aviva has crafted a unique new sound defined by her distinctive vocal presence. Her first CD release was nominated for a 2013 Canadian Folk Music Award.